Happy Holidays from the Artisan Dice shop! We hope this Christmas Season finds you well. It’s always one of our favorite times of the year. The weather is a balmy 80 degrees in Texas so that means it’s time to break out the Santa hats, egg nog, and crank the Christmas tunes to 11! The Minions are busily rocking out to holiday carols while burning the midnight oil in order to get everything we possibly can shipped out in time for Christmas. As most of our customers know, our turn around time typically runs 6 – 8 weeks. 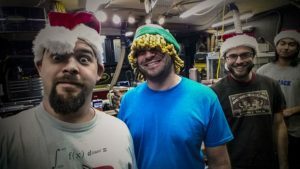 This time of year we know lots of folks are ordering Christmas presents for friends and family so we had our handy dandy Office Minion compile a list of things we have ready for immediate shipment. You can find that list below. We will be adding a few more specialty items in the upcoming weeks as well. Anything you see on the list below will ship in time for Christmas (state side delivery only). Also please note that we will be closing for the season to let the Minions spend the holidays with their families on December 22nd. We will return to the shop on January 2nd. We hope yall have a Merry Christmas and a Happy New Year and may all your rolls be crits. Candy Cane Elemental Dice* – Limited Edition Stone Holiday Dice. *= Available for same day shipping. We will be adding a few more items to this list over the next weeks as well. First Class Mail – our standard free shipping. Priority Mail – slightly faster than first class. Express Mail – lightening quick but expensive. First Class Mail orders placed before December 19st 2pm CST should arrive in time for Christmas. * Priority Mail orders must be placed no later than December 20st 2pm CST in order to arrive with Old Saint Nick. While Express Mail orders can be placed up until December 22nd 2pm CST and still arrive in time for Christmas. Please note that we can not guarantee arrival dates. Consider these a highly accurate estimation based on the USPS recommend ship by dates. You can view them for yourself on the USPS website.